First Minister pledges continued action to stamp out the blight of bigotry. Nicola Sturgeon has condemned the attack on Hibs manager Neil Lennon last week. Lennon was struck by a coin thrown from the crowd in the dying minutes of a game against rivals Hearts at Tynecastle on October 31. The incident was brought up during First Minister's Questions at Holyrood on Thursday. 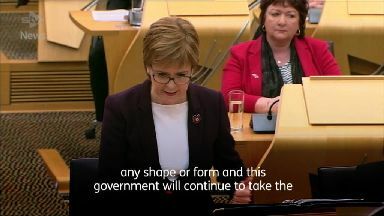 Labour MSP James Kelly asked Ms Sturgeon whether she would join him in condemning "anti-Catholic bigotry and anti-Irish racism", and called for the government to take urgent action against these "unacceptable attitudes". The First Minister replied: "I saw some of Neil Lennon's press conference and thought he conducted himself with great dignity. "Nobody should have to suffer the abuse and the attacks that he has had to suffer. "I unequivocally condemn anti-Catholic bigotry, anti-Irish racism, I condemn sectarianism in any shape or form and this government will continue to take the action we need to take to ensure that Scotland is a country that demonstrates zero tolerance of any of that kind of bigotry. "Whatever your footballing loyalties, or whether you don't have any footballing loyalties, that kind of conduct has no place in modern Scotland and all of us must unite to make that absolutely crystal clear." Police investigations are ongoing into the incident.